Chelsea Football Club and José Mourinho have agreed to part company today (Thursday) by mutual consent. Despite bringing the English championship to Stamford Bridge for the first time in fifty years, winning other domestic honours and never losing a home league game in his three year tenure it has been clear for some time that Mourinho has not enjoyed the full support of Chelsea's multi-millionaire owner Roman Abramovich. The most potent symbol of that discord was misfiring Ukrainian striker Andriy Shevchenko who was said to have been acquired at enormous expense over the Portuguese manager's head and who has struggled for form and Mourinho's favour since arriving as one of the world's most reliable goalscorers. It is not immediately clear what the news will do for sales of the new DVD, "Blue Revolution - The Inside Story", which Mourinho was helping to promote at Fulham Broadway last evening before he adjourned to the club's adjacent stadium for the talks which have seen an end to his, by any measure, stunningly successful time in charge of the team. Failure to get past Liverpool in the semi-finals of the Champions League despite phenomenal spending on players has doubtless contributed to Abramovich's willingness to look for a new coach, but there is no obvious candidate to step into José's immaculately polished shoes and unless the Blues grab Claudio Ranieri back from Juventus the press conferences are likely to be a lot less interesting, though some Chelsea fans might welcome a lower profile appointment. Our downfall has been the littler clubs who've nicked points off us. Mourinho's last game in charge was, perhaps fittingly then, Tuesday night's equally unexpected tame home draw with Rosenborg of Norway in the opening match of this year's Champions League campaign, where the point was only rescued by a second-half header from a certain Mr Shevchenko. At least José will now be able to spend lots of time watching himself star in Chelsea's new film, although we suspect his copy will not be complimentary. If he has managed to bag one as a souvenir he should hang on to it. With the projected release still a few days away he might find himself in possession of one of the few copies not to be recalled to the warehouse and that could make it worth a few bob which could be a handy nest egg to have when you're unemployed. 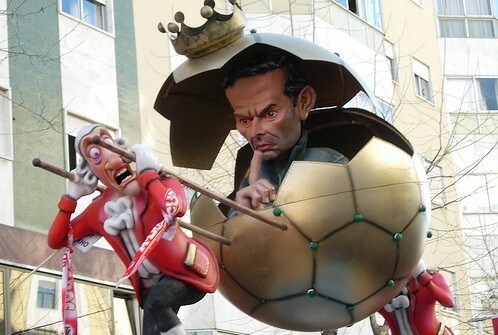 Cracking picture from the carnival at Torres Vedras, another Portuguese icon that understood the value of stout English defenders, via NunoCardoso's Flickr stream.